When internal card fraud arises, an unfortunate, but common, response is to blame the product itself and take cards away from employees or severely restrict card usage. However, the problem is not Purchasing Cards; rather, it is end-user organizations that lack effective controls. This point is clearly demonstrated in the fraud case that rocked a public school district in my home state of Minnesota. I first wrote about it in July of 2017, but it made the news again last week because the party in question—former school superintendent Rod Thompson—pleaded guilty to 19 felonies. The 16-month FBI investigation that started with a look into his P-Card usage led to the discovery of other crimes and policy infractions he had committed. See more below, as well as key questions every Commercial Card program manager should answer. Thompson’s felonies include theft by swindle, embezzling public funds, and possessing stolen property. He admitted to using his P-Card for numerous personal purchases totaling tens of thousands of dollars. I laughed out loud when his attorney said Thompson was remorseful for his actions. Was he sorry after he bought the flat-screen TV for his home? How about after he purchased an Xbox gaming system? Did he ever turn himself in because he was sorry? Was he sorry enough to stop committing internal fraud? No. He was only sorry after getting caught. A group of taxpayers can be credited for cracking the case. In response to a district announcement about a substantial budget problem, they requested, received, and dug into spend reports, even though some people basically called them paranoid. This tells me the district was simply sitting on the valuable information. Either no one internally ever reviewed Thompson’s spend activity or they chose to ignore it. I’m not sure which is worse. The eventual FBI investigation also revealed Thompson used his position to gain personal benefits from a construction company. They paid for tickets to various events (e.g., Minnesota Vikings games) and did work on Thompson’s home. In turn, he awarded them lucrative school contracts. The lesson here is, if you find an employee guilty of one thing, there is a good chance they are guilty of more. Thompson will receive some prison time, as well as pay approximately $75,000 in restitution. 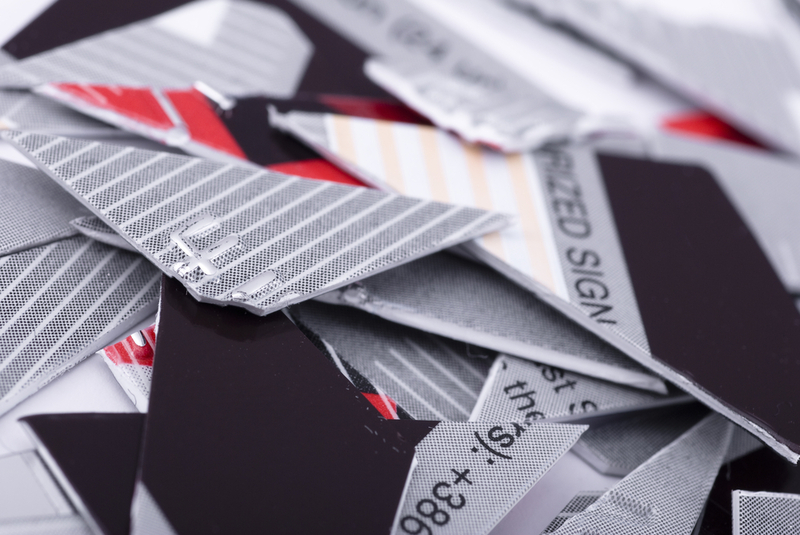 Eliminating Commercial Cards is the wrong way to respond to internal card fraud. 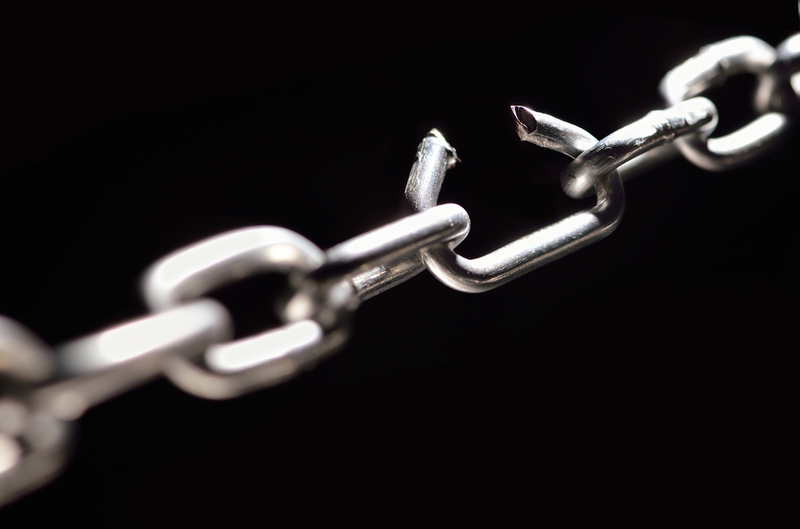 Rather, conduct a thorough program risk analysis and close the control gaps that make fraud easy to commit. If you can answer “yes” to the following questions, your organization is in good shape for preventing and detecting internal card fraud. Nevertheless, a full risk analysis will provide a more complete picture. Does every cardholder have an appropriate-level “manager-approver” who reviews transactions at least monthly? Are cardholders and manager-approvers required to sign an internal agreement, and complete training and/or a quiz each year? Are executive-level cardholders held to the same standards/rules as others? Do you have a separate, robust auditing process (e.g., auditing technology) to identify potential issues and fraud? Does your organization enforce detailed receipt requirements? Thompson often omitted receipts or only provided vague ones. Are tips about suspicious activity followed up on, even if they seem far fetched? Got money left in your budget? Instead of buying more office supplies that your organization does not need, get two valuable P-Card program management tools: a guide on revitalizing program policies and procedures, and a customizable risk assessment template. A single electronic copy of each totals a mere $119.98. Visit the store at: https://www.recharged-education.com/store/. Need convincing? Following is more information and a sneak peek of both resources. If you work for a provider organization and want to obtain these resources to give to clients, there is a license option you can purchase for unlimited distribution. Design matters. I have seen too many P&P manuals comprised of large, unappealing text-heavy paragraphs. To give them new life, the guide recommends separating general information from procedures and making procedures more prominent. Courtesy of a 2016 blog post, here are “before” and “after” examples. Before a revitalization effort, the steps are buried in the text block and the passive voice adds to the dullness. The revised version reflects a script format to separate the tasks by job role. Each action begins with a verb and speaks to the person responsible. See also other content related to P-Card policies and procedures. 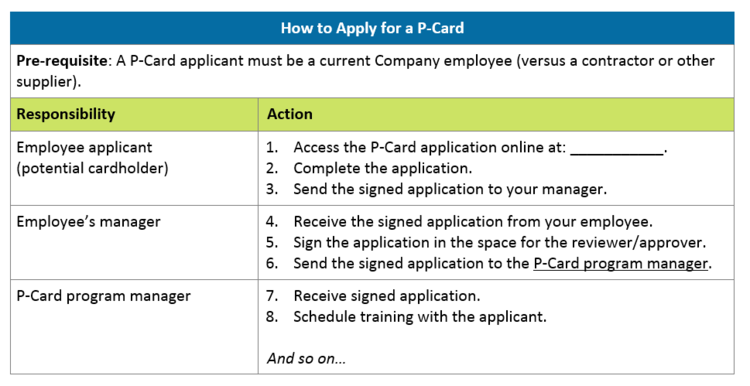 In all, there are more than 100 questions, providing a robust evaluation of P-Card controls. This helps everyone who might review the assessment become more familiar with the program. See also other content related to controls and fraud. Please visit the store to see more and make a purchase: https://www.recharged-education.com/store/.